Canned tuna makes this salad a quick lunch or light weeknight meal. Steam asparagus for 3 minutes; marinate in 1/4 c. vinaigrette. Fry onions in vegetable oil in small saucepan until golden brown. Brush bread generously with olive oil. Broil or grill until lightly toasted. Combine remaining vinaigrette with albacore, tomatoes, capers. Salt and pepper to taste. 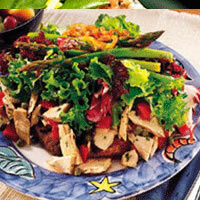 On each plate, place toasted bread slice, mound with albacore mixture, salad greens and asparagus. Top with fried onions and remaining vinaigrette.